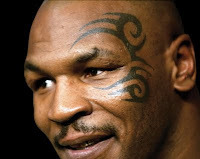 Most people recognize “Iron Mike” as a long-standing nickname for Mike Tyson. Apparently, there may have been a previous “Iron Mike.” Michael Wayne Landrum, a small-time L.A. boxer is suing Mike Tyson for trademark infringement to the tune of $115,000,000. The complaint was filed June 28, 2010 in the U.S. District Court, Central District of California (case no. 2:2010-cv-04795). Michael Landrum last boxed in 1985, and included with the complaint is a document from 1996, a letter from the California State Athletic Commission, stating that his “professional ring name was Iron Mike Landrum.” Landrum is suing for Trademark Infringement, and claims to have a registered trademark with the USPTO. It’s number 66404, which doesn’t appear to be a valid trademark number. Is Mike Tyson still using the phrase “Iron Mike”? Are there any abandonment issues. How will priority be be duked out? All questions that will likely be issues in the litigation.